Urban pop emcee Theophilus London is now making waves internationally as well as stateside with his proper full-length LP, Timez Are Weird These Days. Meshing melodies and genres with creativity and honesty, the Brooklyn-based rapper is repping a new crop of rap-pop stars that are unafraid to express themselves in exotic and refreshingly new ways. With a killer flow to boot, Theophilus recorded the project in NYC, Los Angeles, and Stockholm, so it definitely has that global feel to it. He even includes an indie-rock sounding track called “All Around The World,” which describes what he’s seen, well, all around the world. His growing list of accomplishments include a 2009 mixtape, This Charming Man, last summer’s Dap Kings-assisted single “Calypso Blues,” and this year’s appearances on the Late Show with David Letterman, Jimmy Kimmel Live!, and France’s most popular talk show, Le Grand Journal, it seems that Theophilus London is further set for international stardom. 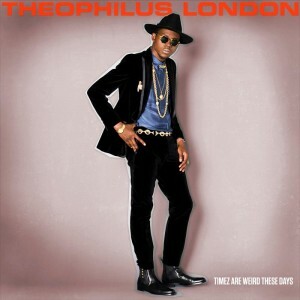 Tags: Theophilus London, Timez Are Weird These Days, Warner Bros.